Lindsay Porter and Cristina Lopez McLauchlan. Keynote speaker Lindsay Porter, the official cetacean expert for the film and Senior Research Scientist of Marine Mammals at SMRU Consulting, discussed the documentary with the students and showed them how the issue directly related to their lives and future. 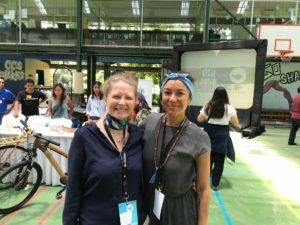 She later led the Plastic Oceans team in delivering a workshop titled “Media and Our Influence”. It demonstrated how best to inform and inspire others in caring for our ocean and our world. 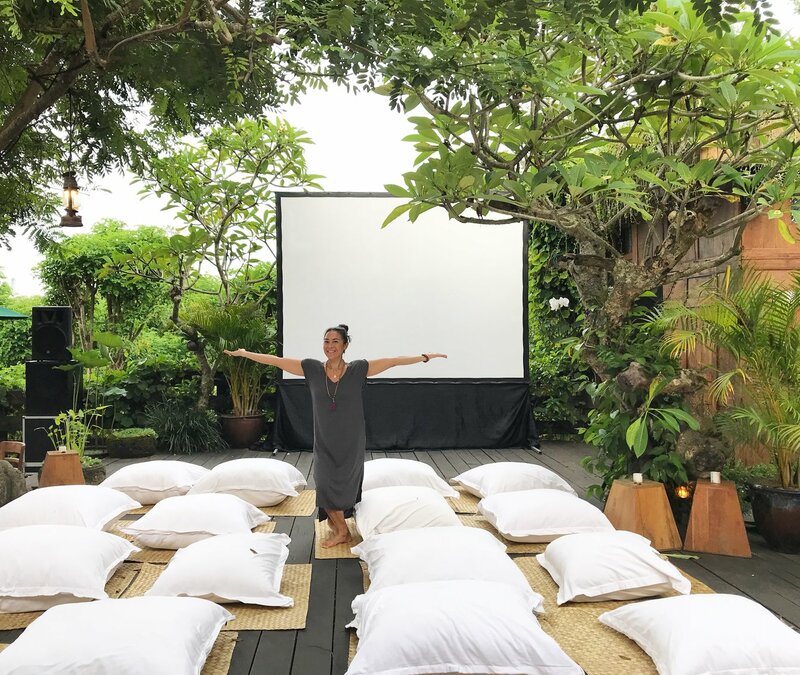 I was honored to have been able to present a workshop and the sharing of yoga. I kicked off the morning of the last day, emphasizing on how we are all connected with each other and with nature. Through the practice, an intention was set to do our utmost to care and support our oceans and our world as a collective. In my workshop, “Conscious Consuming”, students explored alternatives to using plastics in our everyday lives as well as investigating what we put in and on our bodies, and how that has an impact on ourselves and our environment. 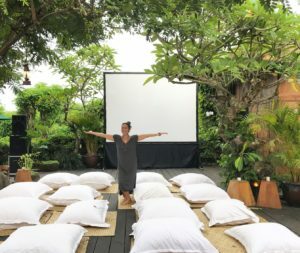 Conscious Cinema, under The Vibe Tribe umbrella, travelled to Uluwatu for a screening of A Plastic Ocean, which was supported by Drifter Surf Shop and Project Clean Uluwatu. Ready for our big night to start! Despite the threat of rain, over 140 people attended. 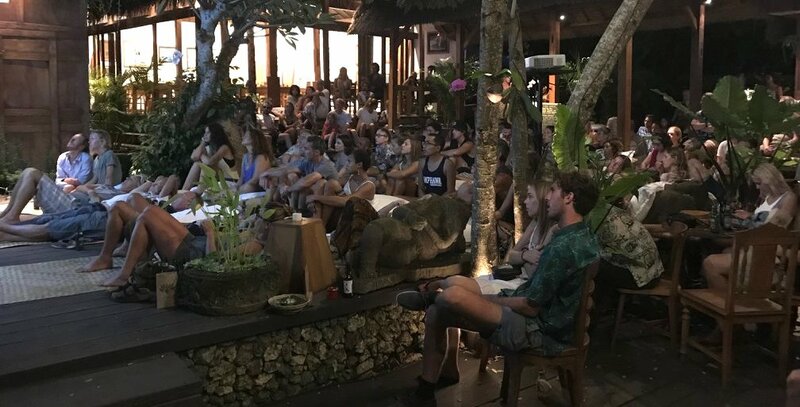 For decades, many have travelled to Bali to enjoy the ocean, though over the years the island has declared a ‘garbage emergency’ as most of its popular beaches are now engulfed with a rising tide of plastic waste. Indonesia continues to be the second biggest maritime plastic polluter in the world after China. 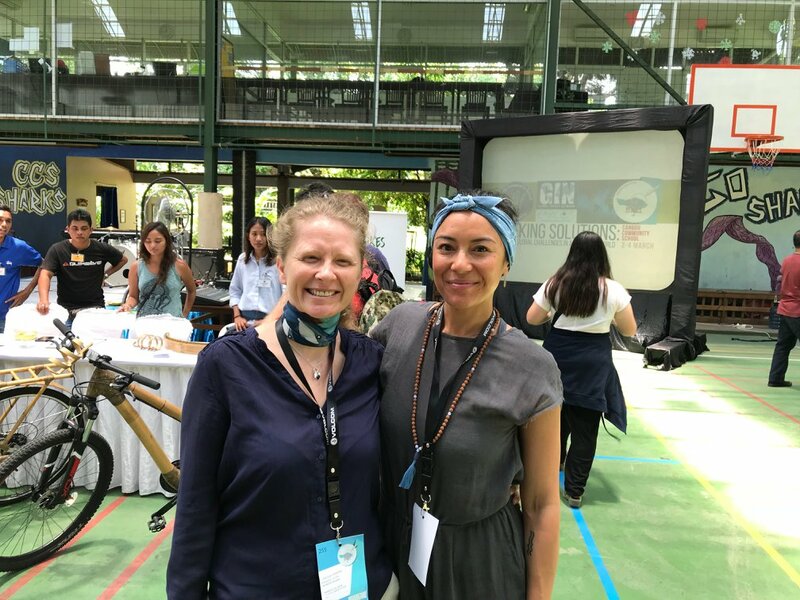 It was apt that the screening fell on the 6th of March, 2018 when diver Rich Horner posted his now-viral video showing the horrible amount of plastic pollution in the waters off of Bali. A Plastic Ocean was well received and the evening raised funds for both foundations. The work of the Plastic Oceans Foundation is imperative in continuing to raise awareness on sustainability and our need to rethink plastic.